One well-known artist; the other, not-so. 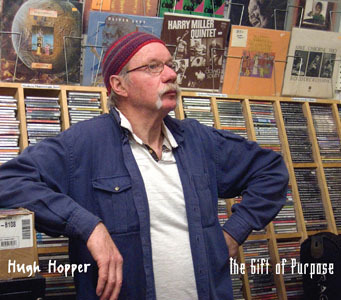 Bassist Hugh Hopper first came to public attention as a member of legendary British group Soft Machine in the late 1960s, but since then the experimental disposition that ultimately resulted in his leaving that band has been heard across a spectrum of projects, from the jamband fusion-centricity of Soft Machine Legacy (MoonJune, 2006) to the spontaneous improvisation of Soft Mountain (Hux, 2007) and experimental looping of The Stolen Hour (Burning Shed, 2004), a multi-media project with graphic artist Matt Howarth. Keyboardist/vocalist Yumi Hara Cawkwell's story is more serpentine. Schooled in Japan and spending eight years as a practicing psychiatrist, she relocated to England in 1993 where she studied left-of-center musical forms, and is now an active participant on the London experimental scene. Dune is Hopper and Cawkwell's first recorded collaboration (under the group name Humi), and it's one of Hopper's most unorthodox releases to date. Hopper began experimenting with primitive tape loops back in the 1960s, inspired by the work of minimalists like Terry Riley. His own 1984 (Columbia, 1973) is a masterpiece of these early experiments, and the unearthed Soft Machine disc Spaced (Cuneiform, 1996) demonstrated a similar disposition for abstruse concepts heard on Dune, without the added benefit of 21st century technology. 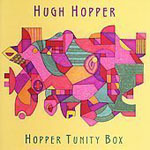 The musica series of improvisations, compositions and, at times, indeterminable blends of the twois largely dark and brooding, though the dynamics range from whisper quiet to near ear-shattering, with Hopper's loops and heavily processed bass taking on far more than the rhythmic role it's often assigned. Cawkwell's keyboard playing runs the gamut from oblique acoustics to spacious, almost psychedelic synths. Her voice is redolent of traditional Japanese music in the eerie landscape of " Seki no Gohonmatsu," while it's purely textural on the delicate abstraction of "Long Dune." While there's no shortage of improvisation, there are clear constructs and, in at least one case, a clear source of inspiration. As many groups reinterpret pop songs from the 1960s forward, "Hopeful Impressions of Happiness" has to be one of the most unusualtwisting early Soft Machine''s "Hope for Happiness" into a new, unrecognizable form. The entire album feels as if it were shot through an odd prism, refracting the church organ and accompanying angular bass lines of "Awayuki I" into a foreboding, alien landscape. Dune isn't without its beauty, but it possesses a power and density that, on tracks like the fuzz bass-driven "Scattered Forest," tends to be more jagged and dramatic. Not the ever-vigilant Hopper's most approachable collaboration, it is one of the most unique. 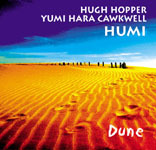 With an emphasis on atmosphere and color, Dune is the kind of experimentation that explains why, forty years on, Hugh Hopper continues to be a vital, if not undervalued, explorer of uncharted sonic territory.